I love origami! There is something magical about making 3D structures come to life with nothing more than paper and your own two hands. 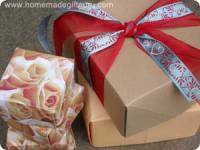 If you are looking for a unique homemade gift idea... Then I am happy to share with you, this DIY tower of gifts using origami boxes. 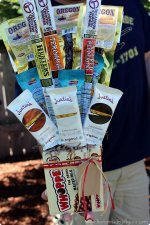 This homemade gift idea utilizes your origami gift box skills (get your origami box skills here if you don't already have them) to make a trendy gift tower in the paper of your choice. 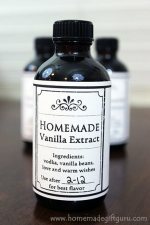 This is a very forgiving homemade gift idea! The boxes don't have to be perfect... once you put them all together, the tower you create will look awesome. If you can find 12x12 inch paper (I use scrapbook paper) thin enough to fold and worthy of the occasion, you can make an origami gift box tower that is as playful, elegant or simply as cute as you desire! 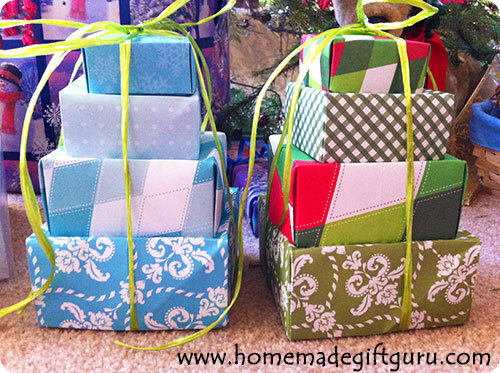 The origami gift box tower shown to the left was a super fun gift I made for New Years! I love beautiful paper, so for me, this project is an excellent way to use lots of gorgeous paper that (I may have) purchased on impulse during my many trips to the crafts store. 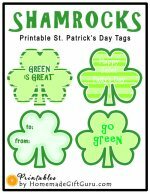 If you don't have paper on hand, I recommend looking for scrapbook paper (tip... card stock is much harder to fold than regular weight paper and requires scoring, which can be done... but does take significantly longer than easy-to-fold paper). 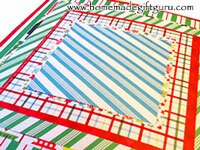 Up to 8 pieces of coordinating 12 x 12 paper. Note: Alternatively, you can use a high quality gift wrap, newspaper, origami paper, anything thin enough to fold and thick enough to be a box. You can always re-enforce the box with a piece of paperboard (like that from a cereal box) cut to size and inserted in the box's top and/or bottom of the box. Cut paper to size. First step, you need perfect squares. For a 4 tier gift box try starting with coordinating paper in the sizes 12 x 12, 10 x 10, 8 x 8 and 6 x 6 inches, these will be the lids of the boxes and the part most visible. You'll need to match each one with paper that is a half inch smaller to make the bottom part of each box... 11.5 x 11.5, 9.5 x 9.5, 7.5 x 7.5, 5.5 x 5.5 inches for example. Fold paper into origami boxes. Follow my origami box instructions to make 4 boxes and 4 lids (or however many you desire for your tower). Fill and Stack. 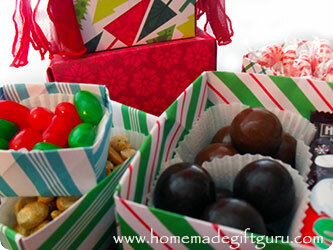 Fill each box with treats and stack them into a gift box tower. 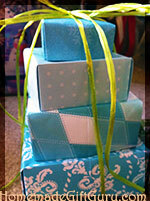 Wrap ribbon around the bottom box and pull ends to the top box to tie a bow. 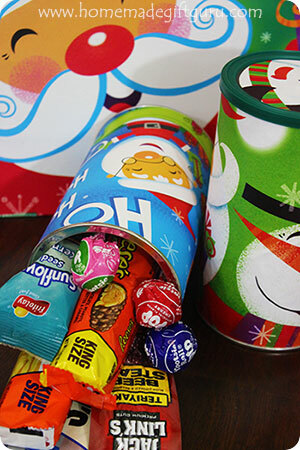 Tip: For freshest candy (especially if your gift box will be traveling) purchase either packaged candy or seal the goodies in air-tight plastic wrap or plastic bags before putting in each box. That's how the gift companies do it. 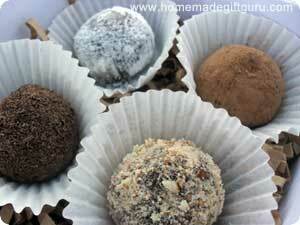 You won't find their goodies enclosed in paper boxes unless they have air-tight packaging as well. When planning to fill your boxes... These boxes are fairly small so don't plan on filling them with gallons of treats and candies. The largest box is 4" x 4" (see the giant malt balls nestled in standard cup cake liners in the big box above) and the smallest box is only 2" x 2" (good for a single scrumptious truffle inside a mini cup cake liner or perhaps a pair of earrings with tissue paper for example). 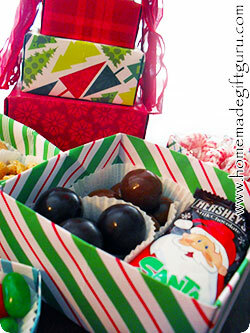 Create a Homemade Canister Gift... They're Cuter Than You Think!